The Finances page shows you two different tabs when the “Coupons” option is enabled in the “Payments Settings”. “Payments” is the default tab. The “Payments” pane shows the information about individual payments. To specify the number of records that are to be displayed at one time, select the required number in the “Default items per page” in the “General Settings”. 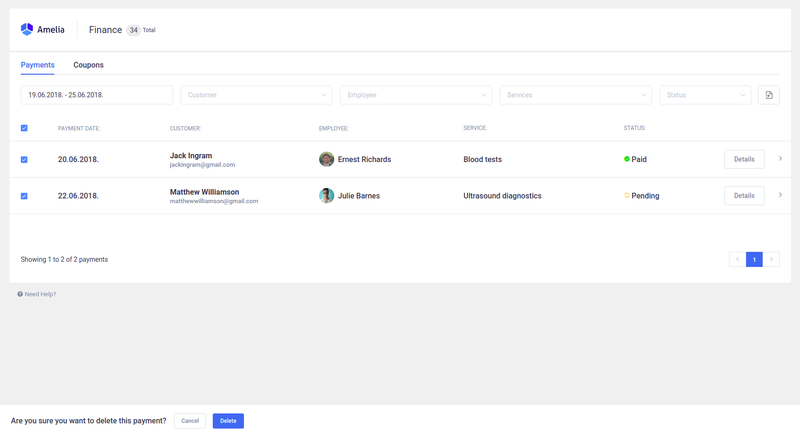 With the filters that appear at the top of the page, you can narrow the results by common characteristics such as date, customer, employee, service or status. The date filter is predefined by the period of seven days starting from the current date but you can change to some other period and the plugin will remember this in all date filters. Your payments can be exported to a CSV file for reporting. At the top right of the “Payments” page and next to the filters, just tap the “Export” button. Clicking on the “Export” button opens a dialog that allows you to choose the delimiter used for CSV and to select the columns you’d like to export. When you are ready, tap on “Export” button in the dialog to download CSV file. The payments table provides information about the payments such as the payment date, customer, employee, service, and status. You can expand a payment (row) by clicking on it. An expanded record shows the information about appointment date, payment method and the amount paid for the booking. Payment passed through either PayPal or Stripe automatically has a “Paid” status. For a payment using an “On-site” method, the payment status and paid amount have to be updated manually. Click the “Details” button to open the details dialog for the chosen payment. Here you can see the detailed information for the individual payment, change the payment data or delete the payment. By clicking on the “Pen” icon in the dialog footer, a small dialog will appear from where you can update the paid amount and the payment status. You can easily delete multiple payments by checking those you want to delete. A dialog box will appear in the table footer when you check at least one payment you want to delete. Once you are certain that you want to delete the records click the “Trash” icon and then the “Delete” button. The coupons tab can be found on the “Finance” page but only if the “Coupons” option is enabled in the “Payments Settings” . 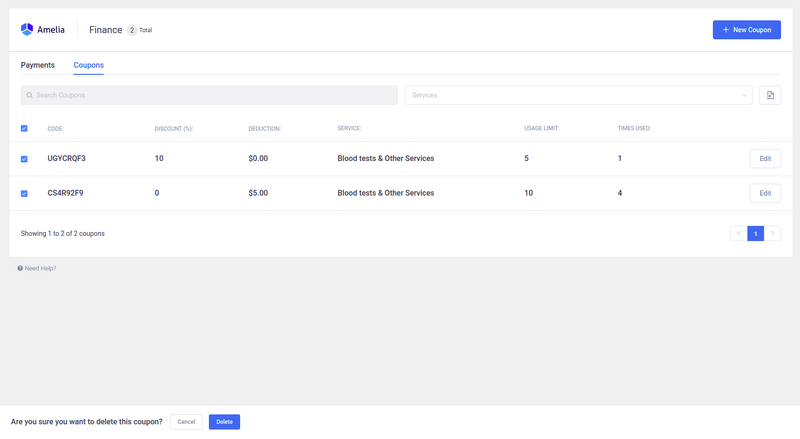 It allows you to create promotions to offer customers discounted prices for their appointment by a percentage or cash discount. 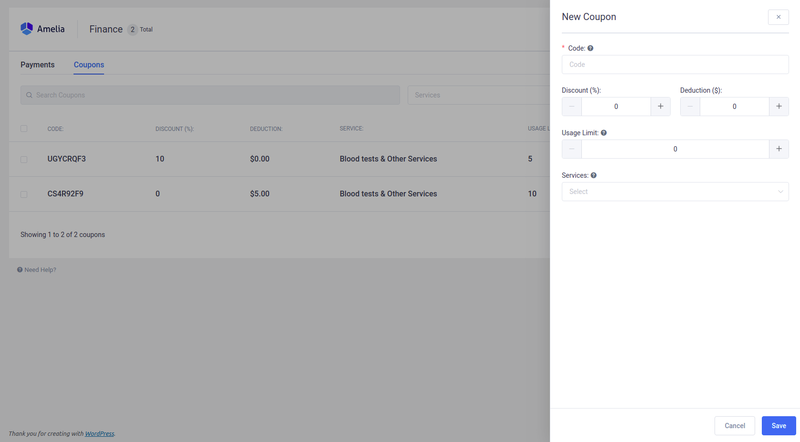 You can use filters to display specific records for a coupon code and the services for which customers can apply coupons. Coupons can be exported to a CSV file by clicking on the “Export” button. Clicking on the “Export” icon button opens a dialog allowing you to choose the delimiter used for CSV and select the columns that you’d like to export. The coupons table shows information about the coupon code, percentage off, fixed amount off (deduction), service(s) where the coupon can be applied, usage limit and how many times the coupon was used. To create a new coupon simply click on the “+ New Coupon” button located at the top of the page. 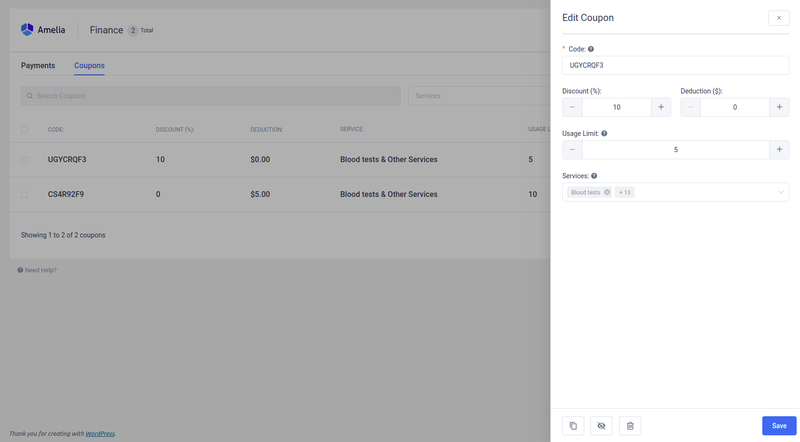 After opening a dialog you need to provide a code for your coupon, discount (expressed in percentage), deduction (reduced amount of selected “Currency” setting in the “Payments Settings”), and the maximum number of times the coupon can be used. You also need to select the service(s) the coupon is valid on. Once you are done entering the coupon information, simply click on the “Save” button and the newly created coupon will appear together with other coupons in the list. 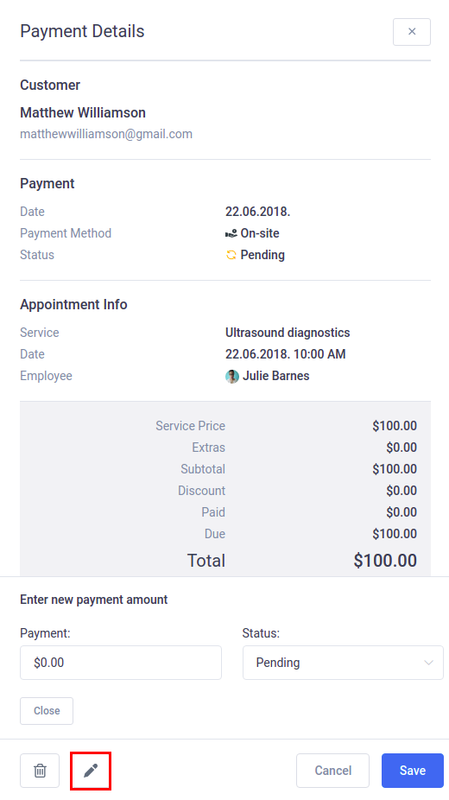 Once you create a coupon, customers can enter the coupon code on the “Confirm Booking” modal to reduce the price of their appointment. To edit an existing coupon, click on the “Edit” button to the right of the coupon you want to change. Clicking on the “Edit” button will open an edit dialog that allows you to update the data in existing coupons. From the dialog, you can also duplicate, hide and delete a selected coupon by choosing one of the actions in the dialog footer. You can delete multiple coupons at the same time by checking the coupons you want to delete. The dialog box will appear in the table footer when you check at least one coupon you want to delete. Once you are certain that you want to delete the coupons click “Trash” icon and then “Delete” button. Hidden coupons will be grayed out in the coupons table and will no longer be valid, so will coupons that have reached their usage limit.